ICAO Airspace classification standardizes the division of airspace worldwide and specifies air traffic services provided in each class. 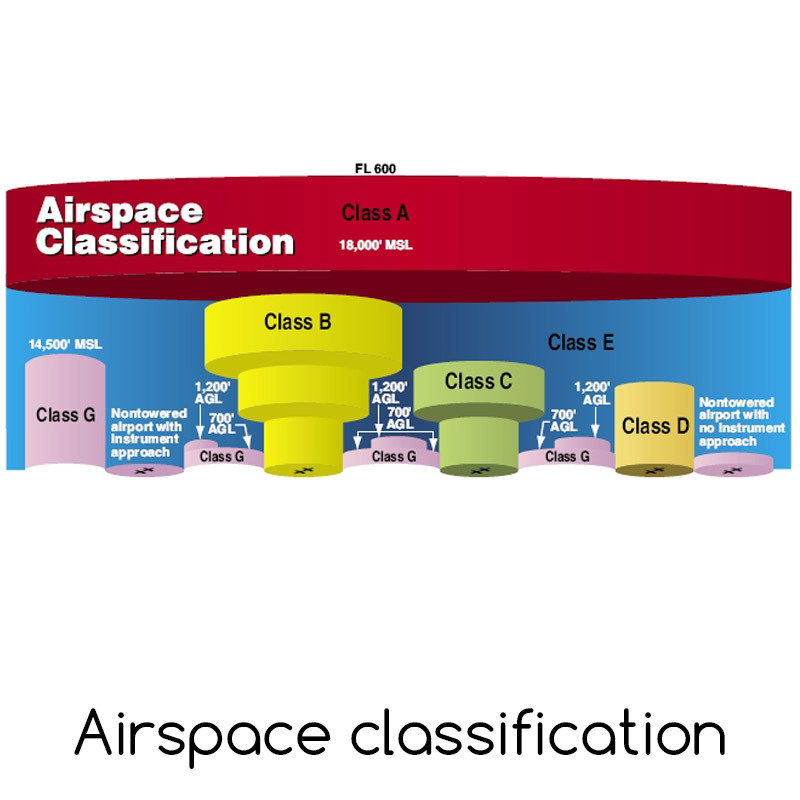 Airspace classification was created by ICAO to standardize the division of airspace by defining seven classes (designated by letters from A to G) and defining basic restrictions, requirements and air traffic service provided for each class. Each nation may classify its airspace using any class it wishes. Countries may also add additional requirements and set additional restrictions in airspace classes they use (they rarely do). National AIPs (Aeronautical Information Publications) may also specify how the air traffic service is provided in each airspace class. Nations can define airspace as a Special Use Airspace to impose additional requirements. It can also impose (or lift) restrictions in a defined segment of airspace (for example allowing high altitude glider flights in IFR-only Class A airspace). I will describe this areas in my next post. Class A airspace is used by some countries as high altitude IFR-only controlled airspace. In United States it stretches from 18,000ft to Flight Level 600 (60,000ft). In Australia – above FL245 (24,500ft) and above FL180 in populated areas. Italy and Great Britain defined terminal areas of main airports (i.a. Rome, Milan, Heathrow, Manchester, Birmingham) as class A airspace. Also airways in several countries are classified as class A airspace (some airways in Britain for example). Controlled airspace around major airports in United States. Also used in Canada for defined segments of airspace between 12,500ft and 18,000ft. The basic difference between class B and class C (that is popular in Europe) is that VFR flights are separated by ATC in class B. In class C airspace pilot flying VFR will receive traffic information but has to rely on his sight to avoid other aircraft. Air traffic control service for IFR and SVFR. Speed limitations: none for IFR traffic, 250 knots (IAS) below 10,000ft for VFR. Mostly used around airports. In some countries class C airspace is used also as high altitude controlled airspace (i.a. Germany, Sweden, Poland) and for terminal areas (for example: Australia, Sweden, Poland). Compared to class B airspace – there is no separation for VFR from other VFR traffic. That means that flying VFR you need to watch out for other planes that are flown visually. ATC will give traffic information (e.g. “FASTAIR 345 UNKNOW TRAFFIC 1 O’CLOCK 3 MILES OPPOSITE DIRECTION FAST MOVING”). ATC will advice you how to avoid traffic if you request it (for example when you can not see the traffic). *In United States clearance is not required for VFR traffic – radio contact is sufficient. Traffic information provided for VFR, IFR and SVFR about VFR traffic (traffic avoidance advice on request). Mostly used around airports (control zones and terminal areas). Compared to class C – there is a difference in how IFR (SVFR) and VFR traffic is separated. In class D airspace separation is not provided and both IFR and VFR traffic receive information about the other plane. Separation between two planes flying IFR is provided. As far as practical traffic information is provided for all aircraft about VFR traffic and for VFR traffic about IFR. In some countries it is used below A, B or C class airspace. In Germany it stretches from 2,500ft (AGL) to Flight Level 100. In USA – from 700ft or 1200ft to 18,000ft. Class E airspace can also be designated around the airport from the ground. Compared to class D – this is uncontrolled airspace for VFR traffic and VFR flights may be conducted without radio contact with ATC. Traffic information provided if possible. Canada uses class F airspace for their Special Use Airspace. I did not find any other country still using this class. Air traffic service provided: Traffic information provided if possible. Usually the airspace below other (higher) classes of airspace. In some countries can reach as high as Flight Level 195 (19,500ft). In Poland it’s the airspace below FL95 (9,500ft). In Germany – below 2,500ft. In U.S. below 700ft or 1,200ft. Class A, B, C, D and E – controlled for IFR flights. Class B, C, D – controlled for VFR flights. When flying online in Vatsim or IVAO networks always remember in which class of airspace you are at the moment. Virtual ATC may give you different instructions in class C and in class D airspace – especially when VFR traffic is close. do I need to be in radio contact with ATC? do I need clearance (to enter the airspace, take-off, land, change altitude or heading, etc.)? will ATC separate my flight from other traffic or should I observe and avoid? 7 airspace classes I mentioned are available and may be used (or not used) by countries that set rules for themselves. There are countries (Canada) that use all 7 classes, there are also countries where only 2 or 3 classes are in use. Before you fly – know the airspace around you. This is the first part of my “Rules of the air” series that will focus on aviation rules, regulations and restrictions. If you have any thoughts on what should be covered in my next posts – share your ideas in comments.